Please forgive me for writing rather than phoning but English is not my first language. I would like to order a king size mattress. I weigh 80kg and my husband 90kg. My sister in law has artisan naturals mattress in medium spring that we slept on for a week when staying at her house. We thought it was very good quality mattress but both found it very much too soft, both in spring and top padding, and woke up sore in the morning, mostly my husband in lower back because he sleep on his stomach. Last week we went at furniture village and John Lewis and tested all the Vi-Spring beds. All the medium spring were much too soft and too bouncy for us, only firm spring and quite firm top padding were comfortable to us. Your website says that we should get medium spring because our weight but we do not like medium springs and know that medium artisan natural was not good for us. So is it acceptable in this situation to get firm spring? Which mattress would you recommend please? We have £1300 for king size mattress and would like a lot of natural fibre if is possible at this price. The advice we provide on our site is general and not specifically linked to individual personal preference. Even though we would suggest a medium spring tension, we would always take personal preference into account when advising upon the right mattress. 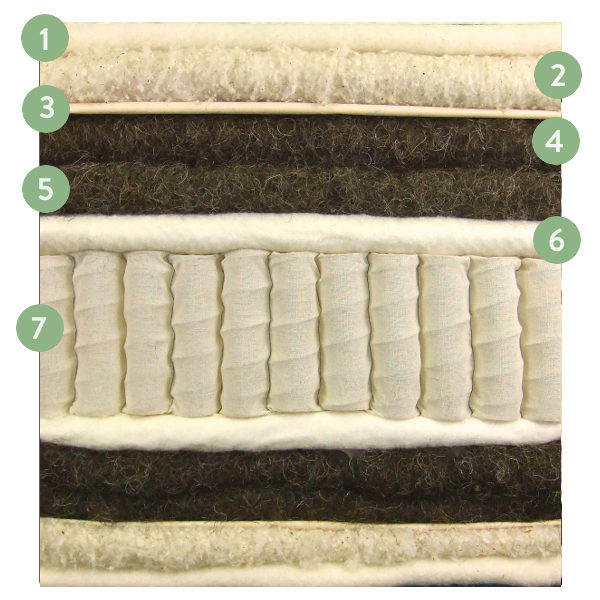 Given your budget, the mattress which would best suit is the Artisan 1500 which has 50/50 natural fillings and man made fibres but has a firmer top layer than the Artisan Naturals which you found a bit too soft. This mattress can be made with a firm spring tension to suit your specific requirement. The Artisan Naturals which you have slept on has 85% natural upholstery, which is the most you will be able to get in that range for your budget. Our Artisan Bespoke is a mattress that has 100% natural fillings but has a firmer feel in the top comfort layers which I feel would be better for you both but it is more costly due to the fillings in that mattress.